Since the start of this season, Chelsea have won 2, drawn 2 and lost 4 Premier league games. What could be the reason for the defending champions’ downfall? Last season Chelsea ran away with the premier league title with the help of Eden Hazard, Diego Costa and Cesc Fabregas, all in blitzing form. The London club started the 2015-16 PL season as strong contenders, if not favourites, yet again, but somehow their season has come undone quite early. At the first international break, 8 games into the season, Chelsea lie 16th on the table. When a club is in a situation like this, it’s almost impossible to blame only one factor or person, but let’s see if we can narrow it down. Last season Fabregas, Matic and Hazard were a powerful force that ran the opposition rugged, time and again. 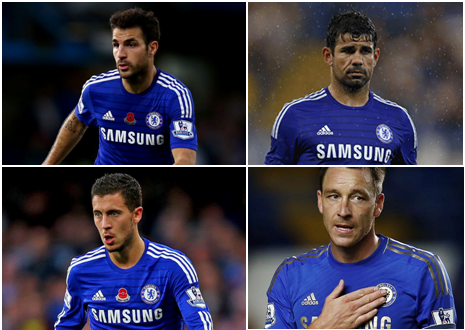 POTY Hazard has failed to make his mark early this season and Fabregas looks a shadow of his old self. Meanwhile, a hamstrung Diego Costa and a laboring John Terry are early indications that Chelsea’s squad might already be out of their depth. After all, how many other premier league managers would sleep well at night knowing their only fit striker is an out-of-form Radamel Falcao? What’s the cause for this drop in form across the Blues’ starting line-up? It can’t be age – except for John Terry, none of Chelsea’s spine are above the age of 28. That means their key players are at their peak in terms of fitness and physicality. Could it be fatigue? None of Chelsea’s vital players were involved in heavy Copa America action. In fact, Chelsea had the advantage as all their English competitors had at least 2 key players involved in the American cup competition while only Juan Cuadrado and Radamel Falcao represented The Blues. If it’s not age or fatigue, it means the players simply aren’t motivated or driven enough. Or they’re still riding the wave of confidence from last season’s glory. It’s a well-known fact that league champions are often guilty of overconfidence when it comes to preparing for the next season. In the summer transfer window, all of Chelsea’s English competitors strengthened their squads considerably, with the exception of Arsenal who brought in a total of ZERO outfield players. The Blues themselves signed keeper – Asmir Begovic, United-flop Radamel Falcao, and Barcelona talisman Pedro. Judging on form, Pedro would be the only player that could get the fans on their feet in that list. It would be easy to accuse Jose Mourinho of being lazy or over-confident with his squad, but it’s a telling sign that a manager who had such an abundance of wealth at his disposal, failed to identify more “valuable” players to bring in and mount a sustained defense of his title. Given that Chelsea have brought in only ONE new regular starter, you cannot even put it down to disparity in the squad for their lack of cohesion. Chelsea’s first match of the season, a 2-2 draw against Swansea, sparked the first of many media debacles featuring Jose Mourinho this season. A man down and with just a minute to play, Eden Hazard went down on the turf. Understandably, Chelsea’s physio – Eva Carniero, ran onto the pitch to treat the midfielder, much to Mourinho’s dismay. A visible and public argument between the team doctor and the manager resulted in Eva Carniero’s dismissal at the club and a lot of unwanted media attention directed at Jose Mourinho. The Portugese manager’s lack of respect when handling the situation is said to have created a rift between players and the manager. In the days following the incident, Mourinho has been the center of many media storms, including the continued war of words with Arsenal manager Arsene Wenger, and several warnings and reprimands from the FA with regards to Jose’s behaviour. None of these incidents or occurrences would have done much in favour of the Blues’ boss as he would have struggled to focus on training and tactics for the club’s oncoming matches. The Blues have lost to Manchester City, Crystal Palace, Everton, and Southampton in the league, and also lost to Porto in their Champions League group tie. If Jose Mourinho really does hope to mount a challenge on at least one front this season, and indeed keep his job, he best block out the media and inspire his players to let the football do the talking. A task that is only going to get harder after he dropped veteran defenders JohnTerry and Branislav Ivanovic in important games.